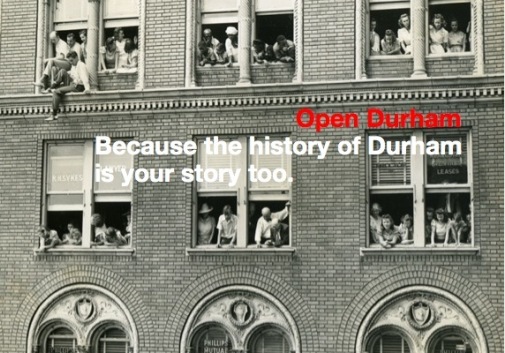 Open Durham is a highly interlinked archive/inventory of information about people, places, and history in Durham, NC. It grew out of the blog "Endangered Durham," which Gary Kueber started in August of 2006 in reaction to the ongoing demolition of historic structures in the city of Durham, NC. Frustrated by the belief that city/county/state policy was very weak in providing avenues for protection of historic property, and that the city had become particularly aggresssive in destroying such property to 'reduce blight', Gary wanted to highlight what was being lost, and that there were more creative alternatives. Incrementally, the site grew to be an archive of over 2000 places, and it became clear that a blog was an increasingly unwieldy platform for this information. Open Durham was launched on 10/17/11. On May 26, 2016, Gary donated the site and its contents to Preservation Durham. Preservation Durham is proud to steward the incredible resource of Open Durham, but we cannot do it without you! Please contribute new content, and consider donating to Preservation Durham (a 501c3 preserving Durham since 1974) to help sustain and expand Open Durham. I did not take the vast majority of the photos on this site. I reference the source of all photographs that come from a specific book/library/collection. You should not reproduce these pictures unless you contact the collection; I have signed usage agreements with several. I am indebted to the original photographers. I try to follow similar guidelines to those that a newspaper columnist would follow. I consider statements of judgement (i.e. "Housing and Community Development seem to be tearing down things as fast as they can fuel the Bobcats") to be my opinion. If I quote anyone, I reference the source - or I heard it myself at a community/city meeting. Open Durham is intended as a published work. Please understand that immense amounts of work went into finding these photos and researching what you've enjoyed reading. Please treat the work accordingly. Open Durham is not intended as a finding aid for photographs for derivative projects. If you absolutely must have a copy of a photo from an institution credited (such as Duke or the Durham Public Library) please contact that original source for permission and a new scan of the photo on the site. It's not necessarily their job to know everything on my website, and they may not even have electronic copies of the photos on the site. Please do not hassle them unnecessarily. Please do not bother private individuals who have been gracious enough to provide their photos to Open Durham. They have shown a kindness to us by sharing these photos for our edification; they have not signed on to be a public archive.